We are proud to offer you the best dermatology care and we strive for excellence, compassion and friendliness in our services to you. We provide dermatological care for a variety of skin diseases that range from common conditions to those that may be more rare. We consider it a privilege to serve patients and clients in St. Louis and feel honored the community entrusts their needs to us. We are specialists in Dermatology & Cosmetic Medicine and every member of our practice is dedicated to ensuring that you receive the highest levels of expert, compassionate care. Our board-certified physicians and helpful staff enable patients to benefit from the latest advances in dermatological science. Whether we are addressing common diseases or complex conditions, our mission is to deliver superior treatment and education. Refer a friend and receive $25 off your next cosmetic treatment. Dr. Lawrence Samuels is Chief of Dermatology at St. Luke’s Hospital and a member of the teaching faculty at Washington University Medical School. He has provided expert dermatological care to patients for nearly 35 years, and is widely respected as a leader in his field. 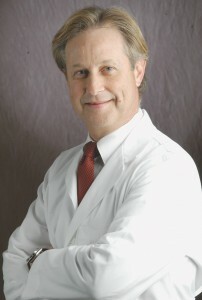 An experienced and innovative doctor, he offers modern cosmetic enhancements in a comfortable environment. He is also known for developing a unique line of Cosmeceutical Skin & Hair Care Products, RX Systems PF®, which has made the science of skin care more accessible and affordable.